Thus spoke Rudolf Steiner in his 'Last Address' to members of the Anthroposophical Society. 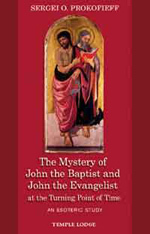 This was his first and only indication of the connection between John the Baptist and John the Evangelist. As Prokofieff points out, Steiner intended to develop and bring to full clarity the short comment reproduced above, but his terminal illness prevented him from doing so. In this brief but enlightening booklet, Sergei O. Prokofieff addresses the mystery of the 'two Johns', solving many unanswered questions. In particular, he throws light on issues of 'incarnation and incorporation', the nature of John the Baptist's and John the Evangelist's respective initiations, the significance of their mutual work at the 'Turning Point of Time', and its relevance to our present day. SERGEI O. PROKOFIEFF was born in Moscow in 1954, and studied painting and art history at the Moscow School of Art. He encountered anthroposophy in his youth, and soon made the decision to devote his life to it. For years he has been active as a lecturer and author. In 1991 he became a co-founder of the Anthroposophical Society in Russia, and since Easter 2001 has been a member of the Executive Council of the General Anthroposophical Society in Dornach. Sixteen of his books are currently published in English translation, including his latest major work May Human Beings Hear It!